In 1965, the conservative white minority government in Rhodesia unilaterally declared independence from the United Kingdom, but did not achieve internationally recognized sovereignty until 1980 as Zimbabwe. The British South Africa Company of Cecil Rhodes first demarcated the present territory during the 1890s; it became the self-governing British colony of Southern Rhodesia in 1923. In 1965, the conservative white minority government unilaterally declared independence as Rhodesia. After the cabinet released the Unilateral Declaration of Independence (UDI), the British government petitioned the United Nations for sanctions against Rhodesia and in December 1966, the UN complied, imposing the first mandatory trade embargo on an autonomous state. The United Kingdom deemed the Rhodesian declaration an act of rebellion, but did not re-establish control by force. The state endured international isolation and a 15-year guerrilla war with black nationalist forces; this culminated in a peace agreement that established universal enfranchisement and de jure sovereignty in April 1980 as Zimbabwe. Rhodesia: An unrecognised state in southern Africa from 1965 to 1979, equivalent in territorial terms to modern Zimbabwe. Wind of Change: A historically significant address made by British Prime Minister Harold Macmillan to the Parliament of South Africa on February 3, 1960, in Cape Town. He spent a month in Africa visiting a number of what were then British colonies. The speech signaled clearly that the Conservative-led British Government intended to grant independence to many of these territories, which happened subsequently in the 1960s. The Unilateral Declaration of Independence (UDI) was a statement adopted by the Cabinet of Rhodesia on 11 November 1965, announcing that Rhodesia, a British territory in southern Africa that had governed itself since 1923, now regarded itself as an independent sovereign state. The culmination of a protracted dispute between the British and Rhodesian governments regarding the terms under which the latter could become fully independent, it was the first unilateral break from the United Kingdom by one of its colonies since the United States Declaration of Independence nearly two centuries before. Britain, the Commonwealth, and the United Nations all deemed Rhodesia’s UDI illegal, and economic sanctions, the first in the UN’s history, were imposed on the breakaway colony. Amid near-complete international isolation, Rhodesia continued as an unrecognized state with the assistance of South Africa and Portugal. The Rhodesian government, comprised mostly of members of the country’s white minority of about 5%, was indignant when amid decolonization and the Wind of Change, less developed African colonies to the north without comparable experience of self-rule quickly advanced to independence during the early 1960s while Rhodesia was refused sovereignty under the newly ascendant principle of “no independence before majority rule.” Most white Rhodesians felt that they were due independence following four decades’ self-government and that Britain was betraying them by withholding it. This combined with the colonial government’s acute reluctance to hand over power to black nationalists—the manifestation of racial tensions, Cold War anti-communism, and the fear that a dystopian Congo-style situation might result—to create the impression that if Britain did not grant independence, Rhodesia might be justified in taking it unilaterally. Unilateral Declaration of Independence: A photograph of the proclamation document announcing the Rhodesian government’s Unilateral Declaration of Independence (“UDI”) from the United Kingdom, created during early November 1965 and signed on 11 November 1965. A stalemate developed between the British and Rhodesian Prime Ministers, Harold Wilson and Ian Smith respectively, between 1964 and 1965. Dispute largely surrounded the British condition that the terms for independence had to be acceptable “to the people of the country as a whole.” Smith contended that this was met, while Britain and black nationalist leaders in Rhodesia held that it was not. After Wilson proposed in late October 1965 that Britain might safeguard future black representation in the Rhodesian parliament by withdrawing some of the colonial government’s devolved powers, then presented terms for an investigatory Royal Commission that the Rhodesians found unacceptable, Smith and his Cabinet declared independence. Calling this treasonous, the British colonial Governor Sir Humphrey Gibbs formally dismissed Smith and his government, but they ignored him and appointed an “Officer Administering the Government” to take his place. While no country recognized the UDI, the Rhodesian High Court deemed the post-UDI government legal and de jure in 1968. The Smith administration initially professed continued loyalty to Queen Elizabeth II, but abandoned this in 1970 when it declared a republic in an unsuccessful attempt to win foreign recognition. The Rhodesian Bush War, a guerrilla conflict between the government and two rival communist-backed black nationalist groups, began in earnest two years later, and after several attempts to end the war Smith agreed the Internal Settlement with non-militant nationalists in 1978. Under these terms, the country was reconstituted under black rule as Zimbabwe Rhodesia in June 1979, but this new order was rejected by the guerrillas and the international community. The Bush War continued until Zimbabwe Rhodesia revoked the UDI as part of the Lancaster House Agreement in December 1979. Following a brief period of direct British rule, the country was granted internationally recognized independence under the name Zimbabwe in 1980. The Bush War was a civil war that took place from July 1964 to December 1979 in Rhodesia, in which three forces were pitted against one another: the mostly white Rhodesian government and two black nationalist parties. In 1965, the conservative white minority government led by Ian Smith unilaterally declared independence from the United Kingdom as Rhodesia, which led to sanctions from the UN. A guerrilla war subsequently ensued when Joshua Nkomo’s Zimbabwe African People’s Union (ZAPU) and Robert Mugabe’s Zimbabwe African National Union (ZANU), supported actively by communist powers and neighboring African nations, initiated guerrilla operations against Rhodesia’s predominantly white government. The war intensified, eventually forcing Smith to open negotiations with the militant nationalists, resulting in Internal Settlement the implementation in June 1979 of universal suffrage and end of white minority rule in Rhodesia. The resulting government was still unrecognized by the international community and the war continued until the British government invited Muzorewa, Mugabe, and Nkomo to participate in a constitutional conference at Lancaster House, resulting in the Lancaster House Agreement, which granted full independence to what was then named the Republic of Zimbabwe. Internal Settlement: An agreement signed on March 3, 1978, between Prime Minister of Rhodesia Ian Smith and the moderate African nationalist leaders comprising Bishop Abel Muzorewa, Ndabaningi Sithole, and Senator Chief Jeremiah Chirau. The agreement led to the creation of an interim government in which Africans were included for the first time in Rhodesia. Ian Smith: A politician, farmer, and fighter pilot who served as Prime Minister of Rhodesia from 1964 to 1979. The country’s first premier not born abroad, he led the predominantly white government that unilaterally declared independence from the United Kingdom in 1965, following prolonged dispute over the terms. He remained Prime Minister for almost all of the 14 years of international isolation that followed, and oversaw Rhodesia’s security forces during most of the Bush War, which pitted the unrecognized administration against communist-backed black nationalist guerrilla groups. Lancaster House Agreement: Negotiations in 1980 that brought internationally recognized independence to Rhodesia (as the Republic of Zimbabwe) following Ian Smith’s Unilateral Declaration of Independence in 1965. The Rhodesian Bush War—also known as the Zimbabwe War of Liberation—was a civil war from July 1964 to December 1979 in the unrecognized country of Rhodesia (modern-day Zimbabwe). The conflict pitted three forces against one another: the Rhodesian government, under Ian Smith (later the Zimbabwe Rhodesian government of Bishop Abel Muzorewa); the Zimbabwe African National Liberation Army, the military wing of Robert Mugabe’s Zimbabwe African National Union (ZANU); and the Zimbabwe People’s Revolutionary Army of Joshua Nkomo’s Zimbabwe African People’s Union (ZAPU). In the first phase of the conflict (until the end of 1972), Rhodesia’s political and military position appeared strong. Nationalist guerrillas had been unable to make serious military inroads against Rhodesia. In the early 1970s, the two main nationalist groups faced serious internal divisions. The black nationalists continued to operate from secluded bases in neighboring Zambia and from the Portuguese colony of Mozambique, making periodic raids into Rhodesia. By 1973 guerrilla activity was increasing in the aftermath of the Altena Farm raid, particularly in the northeast part of the country where portions of the African population were evacuated from border areas. But it would take the collapse of Portuguese rule in Mozambique to create new military and political pressures on the Rhodesian Government to accept the principle of immediate majority rule. The war and its subsequent Internal Settlement, signed in 1978 by Smith and Muzorewa, led to the implementation in June 1979 of universal suffrage and end of white minority rule in Rhodesia, renamed Zimbabwe Rhodesia under a black majority government. However, this new order failed to win international recognition and the war continued. Negotiations between the government of Zimbabwe Rhodesia, the British government, and Mugabe and Nkomo’s united “Patriotic Front” took place at Lancaster House, London in December 1979, and the Lancaster House Agreement was signed. The country returned temporarily to British control and new elections were held under British and Commonwealth supervision in March 1980. ZANU won the election and Mugabe became the first Prime Minister of Zimbabwe on 18 April 1980, when the country achieved internationally recognised independence. 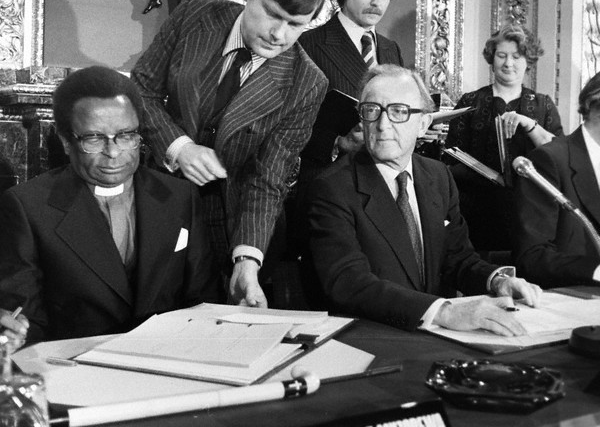 Lancaster House Agreement: Bishop Abel Muzorewa signs the Lancaster House Agreement in 1980 seated next to British Foreign Secretary Lord Carrington. The origins of the war in Rhodesia can be traced to the colonization of the region by white settlers in the late 19th century and the dissent of black African nationalist leaders who opposed white minority rule. Rhodesia was settled by Britons and South Africans beginning in the 1890s and while it was never accorded full dominion status, white Rhodesians effectively governed the country after 1923. In his famous “Wind of Change” speech addressed to the parliament of South Africa in 1960, British Prime Minister Harold Macmillan stated Britain’s intention to grant independence to British colonies in Africa under black majority rule. Many white Rhodesians were concerned that decolonization and majority rule would bring chaos, as in the former Belgian Congo in 1960. Britain’s unwillingness to compromise on the policy of “No independence before majority rule” led to Rhodesia’s unilateral declaration of independence on November 11, 1965. Though Rhodesia had the unofficial support of neighboring South Africa and Portugal, which governed Mozambique, it never gained formal recognition from any country. Many white Rhodesians viewed the war as one of survival with atrocities in the former Belgian Congo, the Mau Mau Uprising campaign in Kenya, and elsewhere in Africa fresh in their minds. Many whites and a sizable minority of black Rhodesians viewed their lifestyle as under attack, which both groups had considered safer and with a higher standard of living than in many other African countries. Although the vote in Rhodesia was technically open to all regardless of race, property ownership requirements effectively denied the franchise to most of Rhodesia’s blacks. The 1969 constitution provided for “Non-Europeans” (principally blacks) to elect representatives for eight of the seats in the 66-seat parliament. Eight seats were reserved for tribal chiefs. Amidst this backdrop, black nationalists advocated armed struggle to bring about independence in Rhodesia under black majority rule. Resistance also stemmed from the wide economic inequality between blacks and whites. In Rhodesia, whites owned most of the fertile land while blacks were crowded on barren land following forced evictions or clearances by the colonial authorities. Two rival nationalist organisations soon emerged: the Zimbabwe African People’s Union (ZAPU) and the Zimbabwe African National Union (ZANU), following a split in the former in August 1963 caused by disagreements over tactics as well as tribalism and personality clashes. 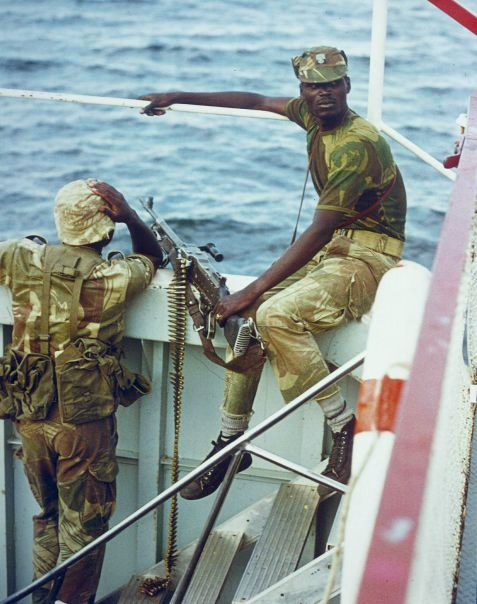 The Bush War: Two soldiers of the Rhodesian African Rifles aboard a patrol boat on Lake Kariba, December 1976. Black Rhodesians made up most of the government’s Security Forces, but some units were all-white. Robert Mugabe rose to prominence in the 1960s as the leader of the Zimbabwe African National Union (ZANU) and has ruled the nation as its president since 1980, establishing a dictatorship that has caused widespread human rights violations and economic depression. Robert Mugabe is the current President of Zimbabwe and has ruled the nation since 1980, first as Prime Minister and then as President in 1987. At the time of his 1980 election victory, Mugabe was widely acclaimed as a revolutionary hero who was embracing racial reconciliation. According to human rights organizations such as Amnesty International and Human Rights Watch, the government of Zimbabwe under the leadership of Mugabe has committed and continues to commit systematic and widespread human rights violations, and his regime is recognized by many as a dictatorship. Although the economy of Zimbabwe initially improved when Mugabe became Prime Minister in 1980, it has since steadily declined and many critics blame Mugabe’s economic mismanagement. Zimbabwe African National Union: A militant organization that fought against the white minority government in Rhodesia, which won the 1980 elections under the leadership of Robert Mugabe. Rhodesian Bush War: A civil war from July 1964 to December 1979 in the unrecognized country of Rhodesia (later Zimbabwe-Rhodesia). The conflict pitted three forces against one another: the Rhodesian government under Ian Smith (later the Zimbabwe Rhodesian government of Bishop Abel Muzorewa); the Zimbabwe African National Liberation Army, the military wing of Robert Mugabe’s Zimbabwe African National Union; and the Zimbabwe People’s Revolutionary Army of Joshua Nkomo’s Zimbabwe African People’s Union. Robert Gabriel Mugabe is the current President of Zimbabwe, serving since December 22, 1987. As one of the leaders of the rebel groups in opposition to white minority rule, he was elected Prime Minister in 1980, serving in that office as head of the government until 1987, when he became the country’s first executive head of state. He has led the Zimbabwe African National Union – Patriotic Front (ZANU–PF) since 1975. As of August 2016, he is the world’s oldest and one of the longest serving heads of state. His 36-year rule has been characterized by gross human rights violations, resulting in placement on the world list of dictators. Mugabe rose to prominence in the 1960s as the leader of the Zimbabwe African National Union (ZANU) during the conflict against the conservative white-minority government of Rhodesia. Mugabe was a political prisoner in Rhodesia for more than 10 years between 1964 and 1974. Upon release Mugabe, along with Edgar Tekere, immediately left Rhodesia with the assistance of Rekayi Tangwena in 1975 to launch the fight during the Rhodesian Bush War from bases in Mozambique. At the end of the war in 1979, Mugabe emerged as a hero in the minds of many Africans. He won the general elections of 1980 after calling for reconciliation between the former belligerents, including white Zimbabweans and rival political parties, and thereby became Prime Minister upon Zimbabwe’s independence in April 1980. Soon after independence, Mugabe set about creating a ZANU–PF-run one-party state, establishing a North Korean-trained security force, the Fifth Brigade, in August 1981 to deal with internal dissidents. Mugabe attacked former allies ZAPU in which the Fifth Brigade crushed an armed rebellion by fighters loyal to his rival Joshua Nkomo, leader of the minority Ndebele tribe, in the province of Matabeleland. Between 1982 and 1985 at least 20,000 people died in ethnic cleansing and were buried in mass graves. Mugabe consolidated his power in December 1987, when he was declared executive president by parliament, combining the roles of head of state, head of government, and commander-in-chief of the armed forces with powers to dissolve parliament and declare martial law. In 2008, Mugabe suffered a narrow defeat in the first round of a presidential election but subsequently won the run-off election in a landslide after his opponent Morgan Tsvangirai withdrew; Mugabe then entered a power-sharing deal with Tsvangirai as well as Arthur Mutambara of the MDC-T and MDC-M opposition party. In 2013, the Election Commission said Mugabe won his seventh term as President, defeating Tsvangirai with 61 percent of the vote in a disputed election in which there were numerous accounts of electoral fraud. Robert Mugabe: Prime Minister Mugabe in 1982. At the time of his 1980 election victory, Mugabe was widely acclaimed as a revolutionary hero who was embracing racial reconciliation. According to human rights organizations such as Amnesty International and Human Rights Watch, the government of Zimbabwe violates the rights to shelter, food, freedom of movement and residence, freedom of assembly, and the protection of the law. There have been alleged assaults on the media, the political opposition, civil society activists, and human rights defenders. The downward spiral of the economy has been attributed mainly to mismanagement and corruption by the government and the eviction of more than 4,000 white farmers in the controversial land confiscations of 2000. The Zimbabwean government and its supporters attest that Western policies to avenge the expulsion of their kin sabotaged the economy. By 2000, the living standards in Zimbabwe had declined from 1980. Life expectancy was reduced, average wages were lower, and unemployment had trebled. As of 2009, three to four million Zimbabweans—the greater part of the nation’s skilled workforce—had left the country. Mugabe claimed that Zimbabwe’s economic problems were a result of sabotage by the country’s white minority and Western nations. He called on supporters “to strike fear in the hearts of the white man, our real enemy.” He accused his black opponents of being dupes of the whites. Amid growing internal opposition to his government, he remained determined to stay in power. He revived the regular use of revolutionary rhetoric and sought to reassert his credentials as an important revolutionary leader.